For example, place a 100 PV Essential Rewards order in your first three months and earn 10 points to redeem for free products. 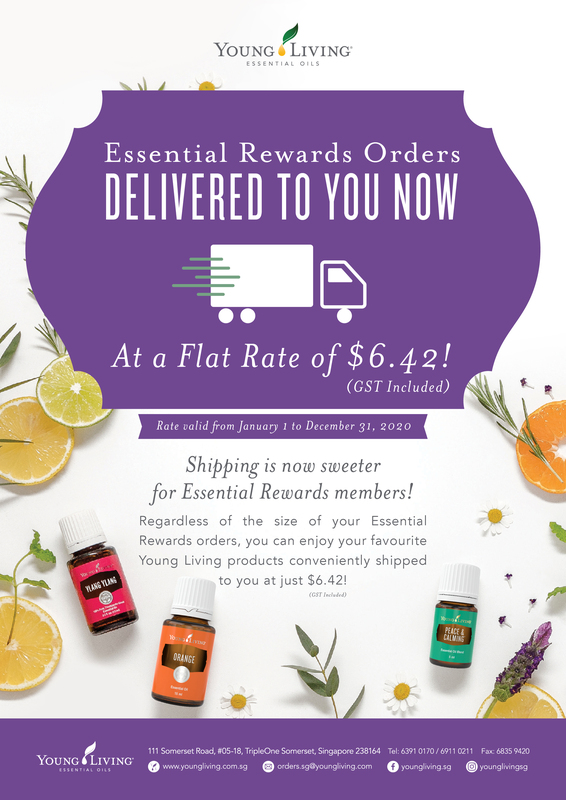 The more you order, the more points you can redeem for free Young Living products. On the phone at +65 6391 0170. 2. Choose your favorite Young Living products or Essential Rewards pack(s) worth at least 100 PV. Participation requires enrollment in a regular monthly order worth at least 100 PV. Young Living reserves the right to exclude any unavailable item(s). Months enrolled in Essential Rewards must be consecutive. Month one begins at the time of enrollment. Points cannot be redeemed until a member has participated in Essential Rewards for two consecutive months. Members may redeem up to 350 points per month. Points will expire on a rolling 12-month basis, meaning you may use them for 12 months from the date you earned them. If you drop out of the Essential Rewards program, you forfeit all points. Generally, one point is equivalent to $1. Redeem points by calling Customer Care at +65 6391 0170.